Perfect eclectic addition to the Black Watch riding breeches. I really like this belt. There was some confusion as to belt length versus waist size, but after that was sorted out, the end result was a very good belt. The customer service is far above par. I hope to by many more items from these guys in the future. I am very pleased with this belt. It is exactly as described, and I cannot believe the quality of the item, particularly given the price. 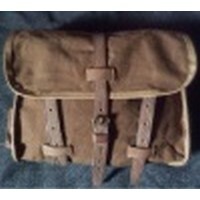 WPG is my go-to source for replica WW1 items!